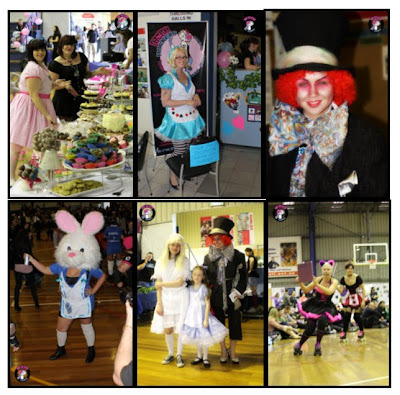 Or following this LINK for the online newspaper edition to see all the images! Is it that time already? 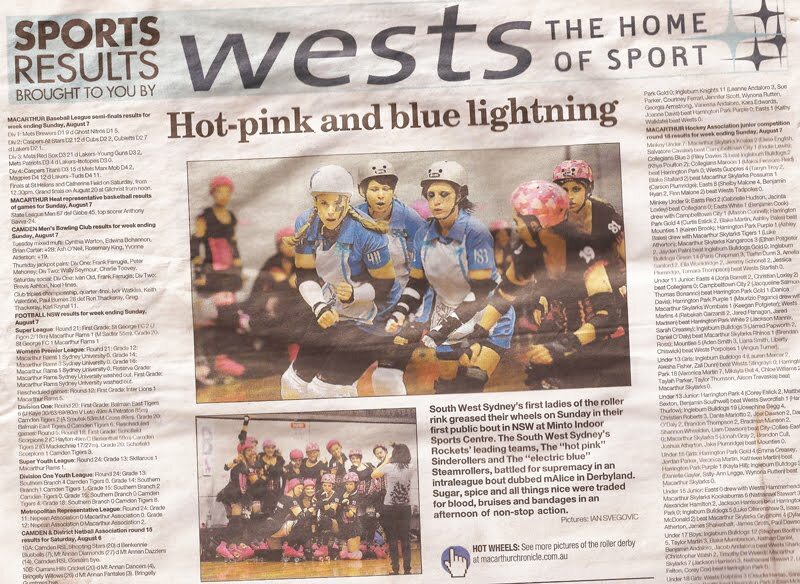 The South West Sydney Rockets are gearing up for what is set to be an explosive bout between the SWSR All Scar Team and the Derbylicious ladies of Hobarts “South Island Sirens” Roller Derby league. 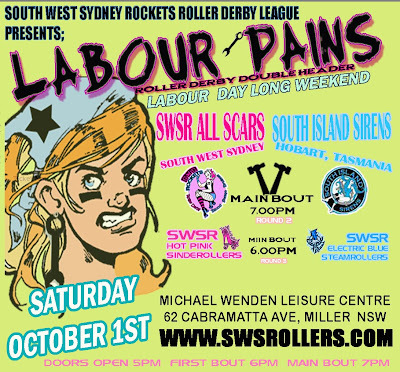 On October 1st, Labour Day Long Weekend, the babes are battling it out for victory in Round 2 of SWSR’s & SIS’s State Vs State Skate off ! 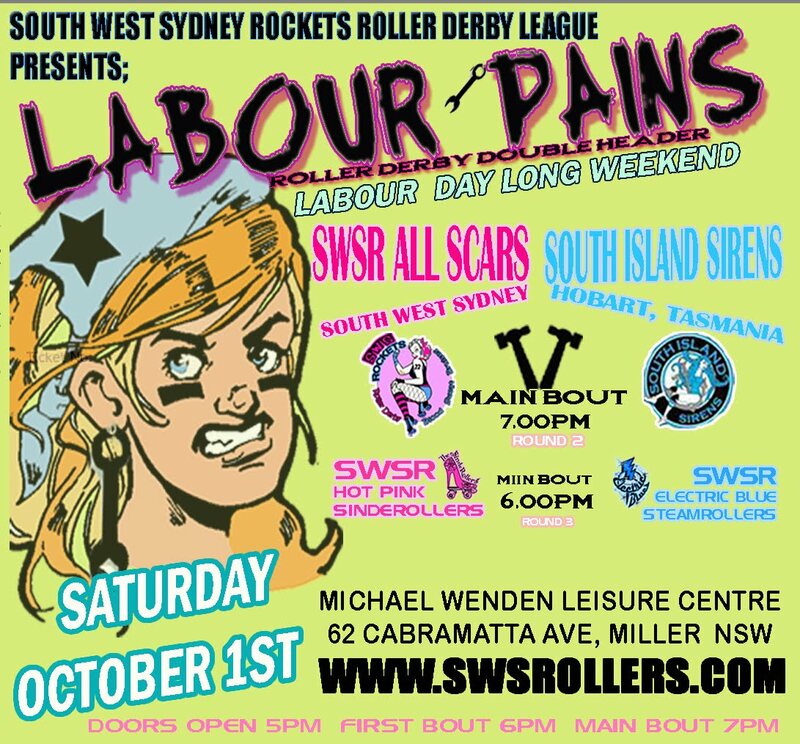 For both the South West Sydney Rockets and the South Island Sirens, this bout is to be the very first Inter-league game played by both teams in NSW! With The South West Sydney rockets defeating Tasmanias South Island Sirens on June 7th after SWSR’s All Scar team flew to. This Bout was the first public bout for both the SWSR All Scars & the Sirens. 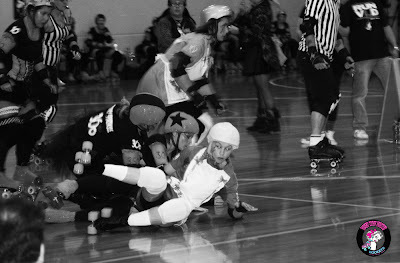 The “Off with Her Head” Queens Birthday Long Weekend bout on June 7th in Hobart , was an amazing game, with both teams neck and neck the whole bout. 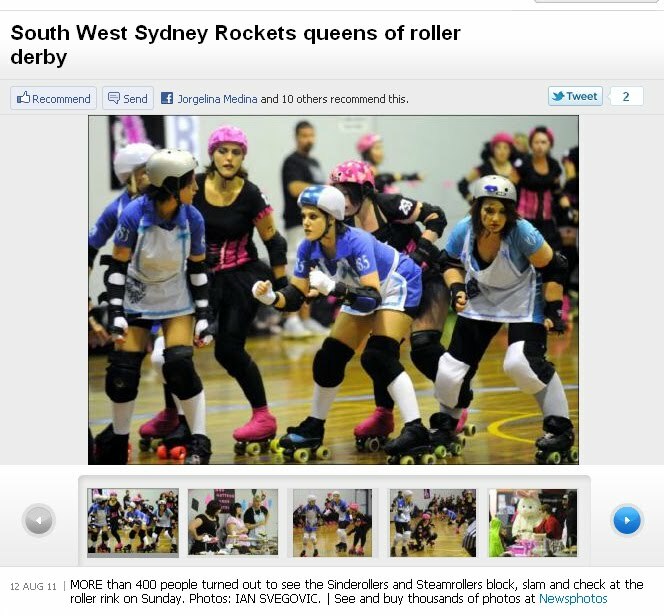 But it was to be the South West Sydney All Scars, who took home the victory !! Will the Sirens be able to do it this time ? 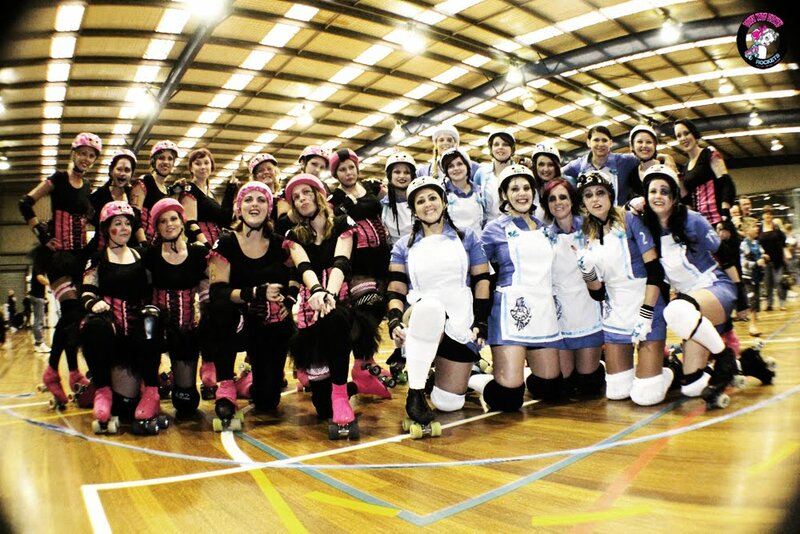 be sure to get your tickets, this is one roller derby bout you don’t want to miss ! DETAILS COMING SOON ! be sure to check our website and Facebook for info ! 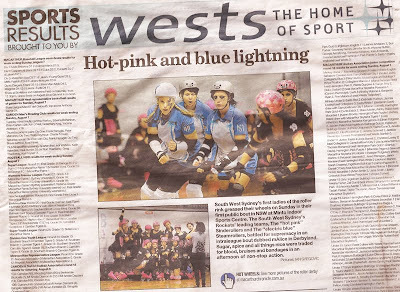 After a year and a half in existence and holding true to our motto of blood, sweat and bruises, the South West Sydney Rockets have overcome adversity to hold our first public bout in New South Wales and the second game of our first intra-league season - and I'm not just talking about the adversity of derby! 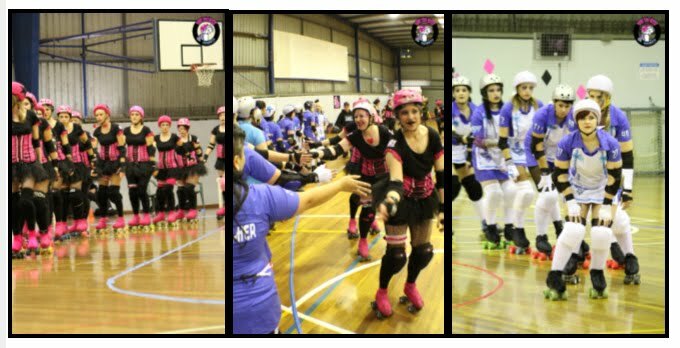 The mAlice in DerbyLand themed bout was held at Minto Indoor Sports Centre on the 7th of August and while most of the action was caused by the skaters, mild panic set in when a thunderstorm caused hail to come through the roof landing on skaters and falling onto the track. 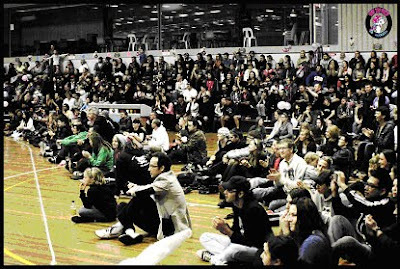 Once the hailstones were removed by some very helpful NSOs and refs, the bout was able to kick off. 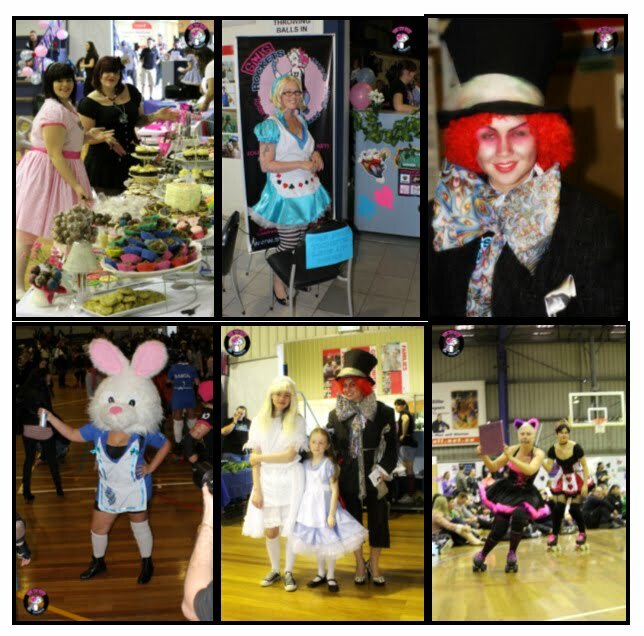 The intraleague affair was themed on the famous fable of Alice in Wonderland - but with a twist. 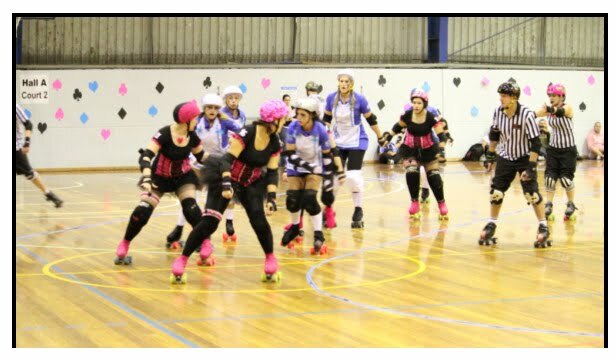 The SindeRollers, dressed as the Queen of Hearts Army, took on the twisted persona of The SteamRollers and their mAlice's - good Alice gone derby. Maintaining the theme of Alice's journey down the rabbit hole, the league's two score girls donned Queen of Hearts and Cheshire Cat costumes to keep the crowd entertained, as some very pretty princesses' hosted a derby themed Mad Hatters Tea Party - complete with cupcakes, cookies and even a roller skate cake, before the bout kicked off with over 250 fans turning up on a very rainy winters day to cheer the two teams on. The first half was hotly contested with close scores on each side, with Kimakaze kicking of the lead for the Sinderollers in the first jam, but with The SteamRollers going full throttle, the Electric Blue babes went into half time with a two point lead over The SinderRollers, with scores sitting at 76 to 74. The Standout jammers of the first half included MeliminateHer and D.Viant.Dee for The SteamRollers, and Kimakaze for the SindeRollers who all scored major points for there teams. Blocker and Pivot standouts were KillaBee, She-Riff & Killawatts for the Electric Blues, with Britney Speartackle, De-Nominator, Dita Von Bruiser and Impure Blonde pounding the opposition to victory. 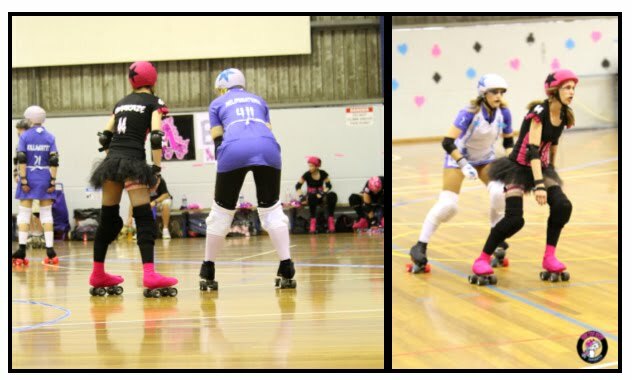 The second half was a fierce battle between the two teams, with jammers Y.T Rad Robin, D.Viant.Dee & MeliminateHer helping the blue team amass more points to the board. With Lil’Tamtrum, Strawbr’y Slaughtercake and Kimakaze keeping the blue team fighting for points. SWSR’s celebrations continued into the night at the Bradbury Inn after party. Check out the South West Sydney Rockets' website and Facebook page for more images of this amazing bout, along with details on future bouts and dates ! !